The Sidney Lanier Bridge Mosaic took nearly a year to complete. The project addressed the lack of public art and historical/cultural education in Brunswick. Reagin is in Milann Gannaway’s troop 30248. She says this was fun yet challenging at the same time. She believes she couldn’t have done this without support. The project was completed with the help of community donors and volunteers. There was a presentation ceremony on October 7th prior to Coastfest. 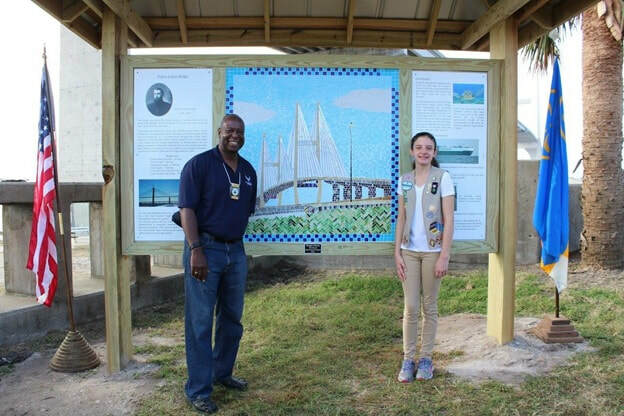 The mosaic is located at Sidney Lanier/Liberty Ship park by the fishing pier. The ceremony can be viewed on reagin’s mosaic Facebook page. You can also read about it in The Brunswick News.